Song of the Water Boatman & Other Pond Poems , written by Joyce Sidman and illustrated by Beckie Prange. Delightful. When I saw Song of the Water Boatman, a 2006 Caldecott Honor Book, I knew it belonged on the Poohsticks bookshelves. A wonderful combination of poetry, art, and nature study, Song of the Water Boatman is a collection of poems about pond life. Poems about algae, the pond food chain, pond plants and different pond animals and insects. "I grow daughters like ears," goes a line in my favorite, "A Small Green Riddle," a poem about duckweed. The gents especially enjoy the poem about the predaceous diving beetle, and the wood duck poem, "Spring Splashdown." Each poem is lovely to read aloud, stunningly illustrated with Prange's beautiful prints, and is accompanied by a short informative paragraph about the subject of the poem. There's even a short glossary at the back of the book. 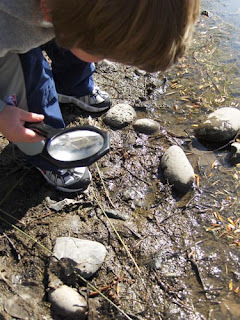 We get this book off the shelf again and again, especially in the spring and fall when we're making our nature excursions. 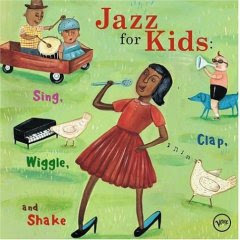 Listening to: Jazz for Kids: Sing, Clap, Wiggle and Shake . Tired of listening to "Itsy-Bitsy Spider" performed in a sappy sweet voice? Who can beat "Old Macdonald" sung by Ella Fitzgerald herself? On our way to and from swim lessons we've been listening to the CD's we borrowed from the library, and this CD is a hit. Kindergarten gent has been walking around the house singing "Old Mac-Don-ald had a faaarm," in his best Ella impersonation. I've been bopping around the kitchen singing, "Ain't nobody here but us chickens." This CD is a great way to introduce classic jazz rhythms to kids because the songs are real jazz, and fun for kids. Some of the songs are familiar tunes with a jazz twist, other songs were new to us. The CD ends with a classic, a family favorite here at Poohsticks, Louis Armstrong singing "What a Wonderful World." Going to: The park for a nature hike with friends from the pool. It's so nice to meet a family who just "clicks." The kids spent nearly an hour scooping water bugs out of the pond with an empty yogurt container I found under the seat of my car. We fed the ducks and watched a great blue heron. Blue herons are a favorite bird of mine, so beautiful and awkward and graceful all at once. The herons nest in a large tree next to the canal feeding the ponds, and we found ourselves walking directly under the tree, so we stopped for a bit to watch the herons in their nests. Playing with: Legos. Kindergarten gent discovered the Viking ship I'd set aside for a family Lego night. Loving husband pulled out the entire Lego collection and set it on the dining room table, and the rest of us built ships while kindergarten gent worked on the Viking ship. I built a way cool space ship using the foot of a Knight's Kingdom guy and the battlement of a castle, but four-year-old gent said it was not cool because it didn't have "shooters," and "That's a foot, Mom!" "I think your ship is very spacey and good," said kindergarten gent. 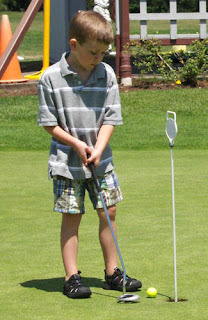 He's my new favorite kid. 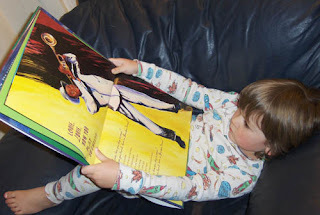 Reading: As an accompaniment to Jazz for Kids, we checked out these books at the library. Jazz , Walter Dean Myers. We've checked out Jazz several times. I think it's that cover illustration-- it just grabs the gents' attention. The text is fun, jazzy, rhythmic. 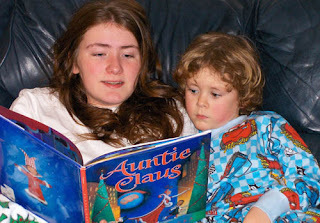 It's a bit much for the fine young gents to sit through, so I often read bits and pieces selectively. What makes this book so special, and the reason the gents choose it over and over, are the wonderful illustrations. The pictures are works of art, and the gents like to page through the book looking at all of the fabulous musical pictures. Duke Ellington (Getting to Know the World's Greatest Composers) , Mike Venezia. We own several of Venezia's books in his artist series. Duke Ellington is written in the same engaging style. Venezia's own cartoon illustrations are accompanied by photographs and depictions by various artists of jazz and Harlem nightlife. The fine young gents particularly enjoyed the pictures of musicians playing different instruments. Venezia's books are always a treat to read. Decluttering: The school counter in the kitchen. I'm at the point where de-cluttering looks an awful lot more like cluttering. My school counter had piles of books, and things to give away, and stuff to put away, and things to do. My sister dropped off eggs this afternoon, and graciously took the pile that belonged to her (thanks!). When I got home I realized how messy the counter must have looked. (Remember, I am hopelessly insecure about what everyone else must think of me, as I may have mentioned before, like in this post.) So I cleaned off the counter except for the two huge piles of school things that demand more attention than just finding them a new home. That's my next task, which is why I was putting off decluttering the counter in the first place. Procrastinating on a little task is way less guilt-inducing than putting off a larger one, and thus more likely to fly just enough under the guilt radar that I won't have to do it for quite some time. I am an expert procrastinator. 1. Sunshine. I love the wet Oregon spring, the rains in the fall, even the cold winter drizzle. By summer I'm ready for three months of hot sunny weather. 2. No school. 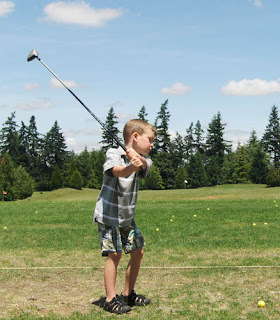 I toy with the idea of year-round schooling. The benefits sound really appealing. But each May I chuck the idea. 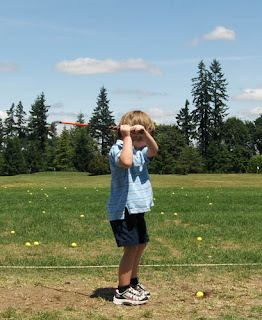 I enjoy the structure and rhythm of our school days, and I also enjoy the flow of lazy summer days. And the flow of not-so-lazy summer days when I can buckle down to a project and actually finish. 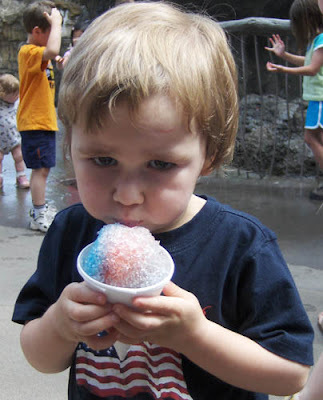 Summer offers a chance for us to recharge and refresh ourselves, to engage in different kinds of learning...or not, if we'd rather veg out with Legos or comic books. 3. Strawberries. And blueberries and raspberries and cherries and blackberries. Fresh local berries and fruits are heavenly delicious. As a matter of fact, the reason I'm late for this Tuesday Ten is because yesterday I stopped by the strawberry stand and got a bargain: "Day-old" strawberries for $5 per half flat. 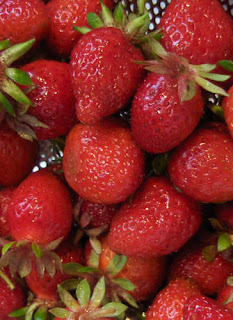 End of season strawberries are perfect for jam-- ripe (almost too ripe), dark, soft and sweet. Last night I made more jam and it is perfect, sweet and flavorful. 4. Fish are jumpin'. Fishing with Grandpa has been the highlight of the summer for the ladies and gents, and for loving husband, for several summers in a row. 5. Water. Jumping through the sprinkler, splashing in the kiddie pool, wading in the river, swimming at the neighbor's pool and at the outdoor city pool, running in the waves at the beach, playing with the garden hose. The fine young gents wear themselves out with water. 6. Swim lessons. 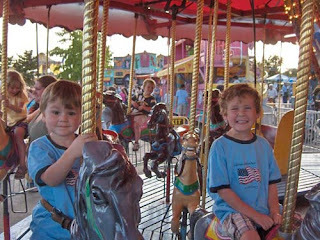 Kindergarten gent and middle gent take swim lessons for four weeks each summer. Youngest gent gets to splash in the wading pool while his brothers swim. 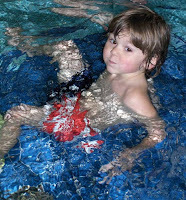 Kindergarten gent is a water baby, his brother a bit tentative, but they both love swim lessons. Swim lessons provide some structure to our days, start the morning with some exercise, and give us a chance to visit with friends old and new. My kids have been taking lessons at the same pool for the past eight years, so every summer we get to re-connect with familiar faces. Tomorrow we've got a picnic date with some friends we met two summers ago. 7. Picnics. Pack some sandwiches, fruit, salad, drinks, sunscreen and off we go for dinner at the park. Or we throw a tea party snack and read-aloud on a blanket under the trees in the back yard. 8. Swinging in the hammock. 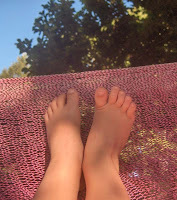 There's really nothing quite so relaxing as swinging in a hammock on a warm summer day with a really good book. 9. No lessons. No gymnastics. No piano or choir or PE or art. I get a chance to take off my chauffeur hat for a few months. 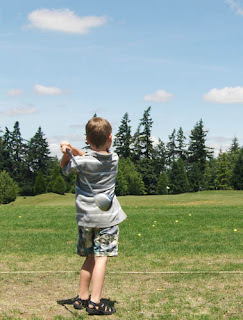 We do go to swim lessons, and kindergarten gent is going to a half-day camp in July, but we get a break from the weekly rushing from lesson to class to activity. 10. Family fun. 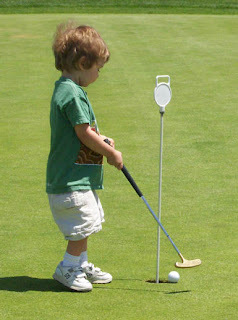 Each June, over dinner, each person chooses the one family activity he or she really wants to do over the summer. 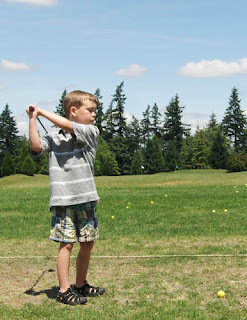 The list is almost always the same: Fishing, go to the fair, visit the beach, Fourth of July parade-barbeque-fireworks, visit OMSI (Oregon Museum of Science and Industry), birthday celebration for lovely July lady, golf. Next Week: Often it's the little things that can give us a pick-me-up or make our hearts glow. Have any special little traditions or games? Love what you see out the kitchen window each morning? Next week's list is "Ten Little Things That Brighten My Day." Someone talk me down off this ledge, please. Seriously, call me up right now and say, "Get down from there. Look, who cares if your neighbor does everything better than you?" All right, I'm not standing on a ledge. But I was standing on a chair chatting at the fence, looking at my neighbor's beautiful garden. The neighbor with the beautiful garden-- everything in rows, plants coming up evenly spaced, everything already planted. Then I looked at my garden. The garden the kids helped plant. The garden in which the dog likes to dig and eat newly sprouted plants. The garden that's only half weeded because I haven't had time to finish. I love my neighbor, truly. And she is one of those blessed people who does everything beautifully. Not only is her garden prettier than mine, her home is lovely and tastefully decorated. (Unlike mine.) Her front yard is beautifully landscaped. She throws dinner parties and enjoys talking to everyone. Her children are sweet and well-mannered, and she's patient and loving. She dresses nicely and has great hair and nice skin, for crying out loud. I can't even hate her with a jealous passion because she's way nicer than me. And of course, my mind keeps on going....I'll bet she's always kind to her children. Her house is always tidy. She's always pleasantly occupied doing homey tasks. Never cross with her husband or lazy or clumsy or grumpy. The whole garden thing seems to encapsulate a comparison between my life and the perfect-in-my-imagination neighbor's life (which, by now, has very little to do with the real-life flesh-and-blood neighbor with whom I've been chatting over the fence). My life is haphazard, crooked, weedy, messy, loud. Her life, and everyone else's too as long as I'm spiralling into the whirlpool of odious comparison, is straight, orderly, tasteful, calm. We all have somone like this in our lives: Someone to whom we're constantly comparing ourselves and coming up lacking. A friend, a neighbor, a sister (or like me, two sisters-- my creative, organized, funny sisters). Comparisons are...well, you know the saying. It's easy to look at another's life and see what our own lives are lacking. One person admires the neighbor's gardening. The gardener admires a friend's flawless dinner parties. The entertainer wishes that she could sew costumes and clothing as beautifully as her sister. The sewing sister wishes that she had the ability to organize her life, or to play more delightfully with her children, or to draw and paint, or to develop meaningful lasting friendships. And so on. It seems there's no end to the ways we can make ourselves feel inadequate. Or maybe it's just me. The silly thing is, I should be delighted with the garden. It's not picture beautiful, but when the gents wanted to help plant the garden I made a conscious decision to let the idea of straight perfectly sprouted rows go, so that they could delight in our garden too. I chose to play in the sprinkler and read stories in the hammock instead of finishing the weeding. I have come to terms with the fact that time is not infinite, and I make my choices as wisely as I can. So why can't I let it go? Because I want a perfect garden and my messy one. No, actually, I couldn't give a hoot about having the perfect garden. But I know that when people look at my garden, they see crooked. And that bothers me, even though I know I shouldn't care. I'll bet my neighbor doesn't care about silly things like this. I'll bet everyone reading this blog is way more emotionally balanced than me and never even dreams of these kinds of comparisons. Excuse me while I go comfort myself with a mocha shake and some cheesecake. Did I mention that she's skinnier than me too? That's why I say thanks everyday! That's an easy way to start! 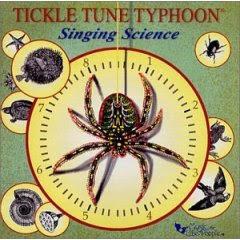 Listening to: Tickle Tune Typhoon, Singing Science. Thirty-one children's science songs with titles like "No Backbone Backbeat" (invertebrates), "The Blue Mammal Waltz," (blue whales), "That's Botany" (plants and photosynthesis), and "Atom Matter" (atoms). A library find, this CD is lots of fun. Some songs are set to familiar tunes. "The Elements," set to the tune of "Dem Bones" includes these lyrics: "One hydrogen connected to one hydrogen, Two hydrogens connected to one oxygen, Two hydrogens connected to one oxygen, Making H2O." 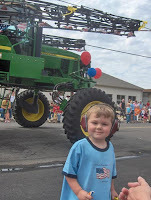 Others have original music and lyrics in all different musical styles, from kiddie rap to country. The gents hummed along to the familiar tunes, and I enjoyed the scientifically accurate lyrics. Playing with: Puzzles. Dear friend down the street talked about doing a book and puzzle exchange. Last night I dropped off eggs and came back with a box full of puzzles. I spread them out on the table and the gents occupied themselves happily for quite some time. Outside My Window, Liesel Moak Skorpen, illustrated by Mercer Mayer. Outside My Window has been such a favorite at Poohsticks that I've renewed it twice. All of the fine young gents like this story of a little boy who spies a lonely little bear cub outside his window. The story manages to be sweet and charming without being sappy, the pictures are wonderful classic Mayer, and it's one of those treasures of a book that's a joy to read out loud. A perfect story for young gardeners, Pumpkin Pumpkin is a beautifully illustrated story telling the story of a little boy who plants a pumpkin in the spring and watches it grow into a giant pumpkin. Many Moons, James Thurber, illustrated by Louis Slobodkin. A ten-year-old princess falls ill and decides that she must have the moon or she will never get well. Despite all of the efforts of the king and his royal court, the moon remains in the sky and the princess remains in her bed. Finally the Court Jester helps Princess Lenore solve her own problem. The story is lovely and entertaining, and Slobodkin's simple illustrations are wonderful. Going: To the vet. Poppy's got a sore mouth. She hasn't been eating well and she's got a red spot around her tooth, so I'm taking her to the vet this afternoon. Decluttering: The puzzle and game shelves in the living room so that I can send some puzzles to dear friend. "Where's my book?" asked eleven-year-old lovely lady, crossly. She tossed her covers about, looked under the bed, stomped across the room to look on her desk. "Hmmph!" she grumped, flopping back onto her bed. "I can't find my book." I offered her the book I'd chosen for her on my last library visit. It was on her bed next to her pillow this morning, with a bookmark inside. As I left her room and walked down the stairs, I glowed. This lovely lady with autism has been a book lover from the time she was a tiny baby, and a voracious reader from the time she sat down with Are You My Mother? and read the entire book out loud. ("How did you teach her to read?" asked her teachers. I shrugged. "I didn't," I said. "I just listened while she figured it out.") Here's the catch: Lovely lady only liked to read the same things over and over again. When she was a toddler, I had to read Goodnight Moon over and over and over. We literally read that book to shreds. She memorized everything I read to her. At age three, after two readings, she could recite nearly the entire text of Where the Wild Things Are. 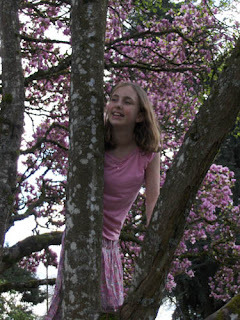 In the primary grades, she was obsessed with Calvin and Hobbes. Over and over and over she read each book, in her own particular order, pacing the room. If the books weren't handy, no matter. She'd already memorized them anyway. Finally she branched out into chapter books, but only certain chapter books, usually books in a series, and always the same books over and over and over. Betsy-Tacy was the first of these kinds of books-- I "forgot" to pack lovely lady's beloved Calvin and Hobbes. And in her backpack instead, waiting to be discovered during the long drive to Grandpa's house, was a pretty book with a charming picture of little girls on the cover. At some point we realized that lovely lady, while a very fluent reader, struggles mightly with comprehension. Reading the same stories over and over help her to finally understand what the story is really about. This past school year, I insisted that she spend twenty minutes a day reading a book that's new to her. You'd think I'd asked her to fetch me the moon. Every day she grumped and groaned as she grumbled her way toward her favorite reading chair. But as the year wound on I noticed that the grumping and groaning during the actual reading time had waned. She usually sits to read now, instead of pacing. Instead of pretending to read, but reciting a different book instead, she sits quietly, turning the pages. Last night she was looking for Bridge to Terebithia, a book she's never read before, because she wanted to know what came next and couldn't stand that she couldn't find it. She started a new book and bookmarked her place because she wants to read it again the next day. She was able to tell me a little about the story. Just at the point that I was considering clearing out all of the more "girlie" chapter books, she's combing the bookshelves for new books. She's growing up and learning how to read, to really read. Her victories may be small. But for her, and for me, sometimes those small steps are huge. With this lovely young lady I don't take the little steps for granted. What a blessing, that little glow I feel when I think about her discovering the world of books in a whole new way. 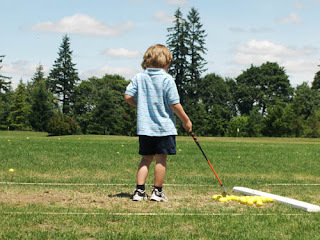 Today's Tuesday Ten challenge: A Day in the Life....Wait until the end of the day, post ten things that you did today. They don't have to be exciting, or even particularly interesting if you had that kind of day. The idea is to get a peek into your daily life. 1. Swim Lessons. Not for me, for the fine young gents. Two-year-old gent splashes in the wading pool while his brothers take lessons. For them, swim lessons means eating breakfast, changing into swim trunks and leaving for the pool. For me, swim lessons means packing backpacks with clothes and towels and setting out swimwear and shoes the night before, packing a snack in the morning, and getting everyone out the door on time. The youngest of the fine young gents had a poopy diaper right before it was time to leave. Four-year-old gent insisted that the Band-Aid on the bottom of his foot must stay on, then sat down and cried when it wouldn't. And, best of all, someone left the car door open all night long, so my car had a dead battery. We took loving husband's car and he dealt with the battery. 2. Library. I wanted to go to the library yesterday, but the fine young gents insisted that we can't go to the library on a Monday because Tuesday is Library Day. So we went today. They each chose two books to check out. We signed up for the library reading program, so they each got to choose a free book to keep. Getting into the library was a challenge because both lovely ladies are out of town, I forgot the book bags, and the youngest gent has decided he's too big for the stroller, so I had to try to navigate a busy parking lot while shepherding a two-, four- and six-year-old and carrying an armload of library books. 3. Lunch. Making lunch is boring. But despite my boredom and distaste for the task, my inconsiderate children insist on eating lunch every day. 4. Declutter. Every six months I go through the house and toss, recycle, give away or sell everything that we don't need. (Well, except for the basement. I intend to clean the basement and never get to it-- I was supposed to clean it out last summer. Yeah, that's going well.) My goal over the next two weeks is to declutter something every day. Yesterday was the craft supply cabinet. Today I reorganized the living room bookshelves-- the school shelf and the kids' bookshelf. Does it still count as decluttering if there's now a huge pile of books on the living room table waiting for a home? 5. Garden. My other two-week goal, to get the garden back in shape. Yesterday I weeded around the garden boxes. Today I weeded in my two empty boxes and planted pumpkins and squash. The gents planted some sunflower seeds and otherwise got in the way, er, helped. 6. Hammock. Problem is, youngest gent was filthy and wet, and when I told him No thanks, I didn't want company, he decided it would be fun to swing Mama. And the dog thought it great fun to nibble on my dangling toes, which tickled. Not quite the restful time I'd envisioned. 7. Neighbors. I saw neighbor mom over the fence and invited neighbor kids to come play in our yard, so they did. The kids splashed in the plastic wading pool and played with the hose, neighbor mom and I chatted. I love my neighbor. Poppy is a complete basket case when people come over. She pees on their feet and jumps on them and otherwise makes a complete and utter nuisance of herself. I tethered her outside so that the kids could play without getting jumped on. Neighbor mom waited until Poppy was very calm, then went to sit nearby. Once Poppy calmed down again she sat down with her and petted her until she was completely calm. Not many people are willing to sit through that much frantic jumping and sniffing and rolling, but she did it, and Poppy settled down nicely. Wonderful. 8. Dinner. I really didn't want to make dinner, so we had chicken salad sandwiches, leftover noodles, watermelon and salad. For a great summer salad, just toss some blueberries and raspberries with fresh greens, top with goat cheese and some kind of nuts, and serve with your favorite balsamic vinaigrette. Better yet, take some of the berries and toss them in the blender with the favorite balsamic vinaigrette for berry vinaigrette. Yum. In the middle of dinner the phone rang. It was dear friend calling from the bookstore, wondering where I was. I hadn't forgotten, I'd just completely lost track of time. I had no idea the afternoon was gone and we were well into the evening. 9. Chat. Dear friend and I talked for over two hours. We talked about teenaged daughters, autism, middle school, dogs, neighbors, materialism, kids with too much stuff and not enough guidance, families, and told stories about our lives. By the time I got home, loving husband had put the boys to bed. 10. Walk the dog. I took Poppy for a walk. 11. 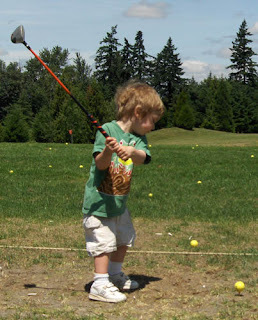 Blog, fold laundry, spend time with loving husband, set out things for swim lessons tomorrow. I expect tomorrow will be much the same. Happy days to you. Next Tuesday: Ten Things About Summer. Anything at all, as long as it's got something to do with summer. Things you love, things you hate, things you plan to accomplish, summer vacation plans. "You couldn't have it if you did want it," the Queen said. "The rule is jam tomorrow and jam yesterday - but never jam today." "It must come sometimes to jam today," Alice objected. "No it can't," said the Queen. "It's jam every other day: today isn't any other day, you know." Yesterday we celebrated the last day of school with a trip to the strawberry patch. 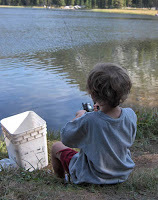 We left youngest gent home with dad, packed water bottles and sunscreen, and off we went. It was a delightfully warm sunny day. The strawberries were perfect-- warm and sweet. As we picked, the lovely ladies sang in lovely harmonies. We stopped to watch the hawks circling overhead, and examined the strawberry runners creeping out into the spaces between the rows. Elder lovely lady dreamily picking through the strawberries at a snail's pace, trying to be conscientious and having absolutely no idea that despite the warm day she was moving slower than molasses in January. Her younger sister, enthusiastic for the first fifteen minutes then alternately picking berries reluctantly or sitting in the dirt sulking because we weren't done yet, then standing up and dancing and singing. 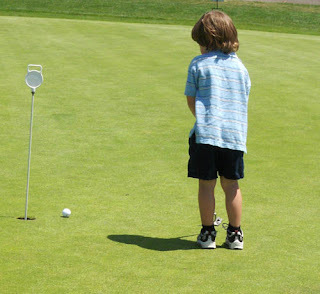 Kindergarten gent, picking enthusiastically and trying his best to stick to the "Pick ten before you eat one" rule, then getting distracted and playing, then buckling down to pick so that his "team" (everyone but Mom) could win. Middle gent putting one or two berries in the bucket, but mostly playing between the rows and eating strawberries. Team Mom won the strawberry race, by the way. About ten minutes after fourteen-year-old lovely lady remarked at how fast she was picking, look, the bucket is almost 1/3 full, I was heading to get my second bucket. "Team Mom" picks in a way that expresses her personality, too: Task-oriented and efficient. 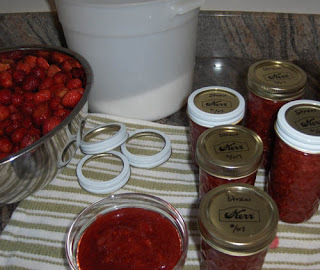 The gents and I spent the afternoon and evening making strawberry jam. 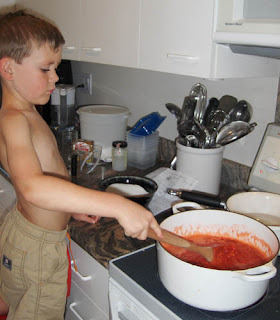 My enthusiastic jam helpers stirred, licked the sugar spills off the counter, ate the extra strawberries so that we wouldn't have too many, and tasted the jam. There's nothing like the sound of jam jars sealing. When I hear that sound, I imagine that they're sealing in the summer, so that on a dreary winter morning when we're chilled and bleary, we can open a jar of strawberry jam and spread a bit of warm sweet summer on our toast or pancakes. We had jam today. Waffles and strawberry jam. Perfect. Our first adventure at the zoo was a trip to the first aid station. Ten feet into the zoo entrance, we stopped for sunscreen all around, and younger lovely lady was stung by a bee. She handled it well-- as a matter of fact, last week she shrieked more loudly at seeing a bee than she did at the zoo when she was actually stung. After a sting-ease wipe, a band-aid and some ice, lovely lady was ready to head home. I packed a picnic lunch so that we wouldn't have to spend far too much money on greasy hamburgers and hotdogs. 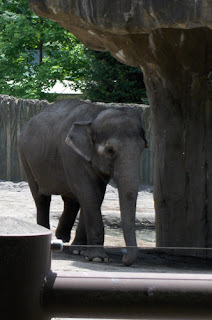 The elephants are right next to the picnic lawn. The smell of the elephants wafted over our picnic a time or two. Yummy. 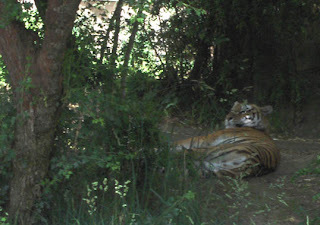 By the time we got to the tiger, I was ready for a nap too. Winged Wonders, the butterfly exhibit. Butterflies fluttered all around us in the tent. 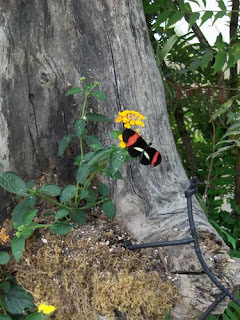 This is a Small Postman Butterfly. The Small Postman was the most common fluttering around the tent. Wear red or yellow if you visit a butterfly exhibit like this one, and a butterfly may land on you. The ladies and gents held very very still, but the butterflies only seemed to like loving husband, who didn't give a hoot whether or not a butterfly landed on him. 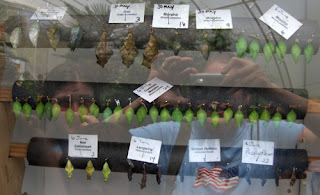 Look at all of the different chrysalids. Kindergarten gent, in particular was fascinated by the variety, especially by the ones that look like large dry leaves. I'm so glad we decided not to walk on by the bats. Youngest gent is sitting on my lap as I type. "Bats! Look, it bats!" he says of the photo. "Bats eat nanas. Bats bite nanas and eat nanas." Clearly the bats made an impression. 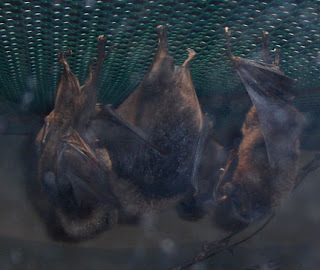 It was feeding time and the bats were devouring bananas, melons, and lettuce. It was fascinating to watch the bats flitting and darting and eating. Oh, but that bat cave....Holy warm and smelly, Batman! The lorikeets were on my must-stop list. We were all tired and the littlest gents were dragging, and then we passed by the exhibit. "We have to go back for the lorikeets before we have our snack," I told them as we made a U-turn. 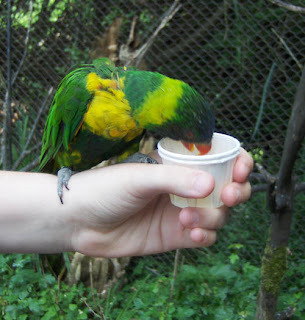 I purchased a juice cup for each person, $1 for a teeny little cup half full of special lorikeet apple juice. It was worth it. How often do you get a parrot to perch on your arm? The lorikeets were a little full, after all they'd been drinking juice all day, but then again, who can resist a sweet treat? Birds aren't the only ones who can't resist a treat. Last week, I asked this question: Who are you? What forces have shaped your destiny? What has made you the unique and quirky person you are today? I can't wait to read your lists, those of you who've written them. 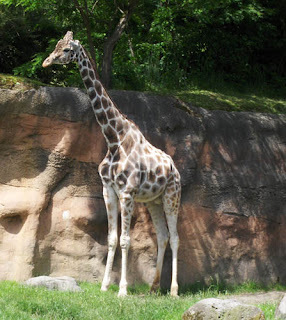 My Tuesday Ten destiny was shaped considerably by the fact that yesterday was $2 Tuesday at The Oregon Zoo. It cost our family $12 to get in instead of nearly $60. So blogwise, it's Tuesday Ten on Wednesday this week. 1. Growing up on a farm. Acres to roam. Cows and horses and chickens and pigs and geese (mean ones) and ducks and cats and dogs. A tractor and an old pickup truck. Giant anthills and woods and a hay barn. Bee stings. Apple trees and blackberry vines and a garden as big as my current back yard. One beautiful sunny day when I was about 5, or so the story goes, my dad was cutting the grass in the hay field. Somehow he messed up the t.v. antennae. My sister and I came running out of the house in a panic, "The t.v. 's not working!" And....that was the end of the television. That's right. No television. We read a lot. We found things to do, like chase the geese and poke anthills with sticks and jump around in the hay loft and and wade in the ditch and climb trees. We made up stories, acted them out, and wrote them down. We played in the mud and got dirty every day. Our Barbies had wild adventures. We exercised our minds and our bodies. I have nothing against television these days, by the way. Given my druthers I'd just as soon get rid of it, but loving husband likes t.v. and it's kind of fun to have around. 2. Turning forty. Well, not the turning part so much as the getting here. What a journey it's been. I've written a bit about this station on my journey here. I still feel like I'm twenty-five and I feel like a completely different person than the twenty-five year-old me. Life certainly isn't the way I'd pictured it (completely over and stiflingly boring), instead it's richer. I suspect it's been this rich all along, but it's just taken me this long to notice. Ten Things I Never Thought I'd Be at Forty here. 3. My sisters. I have two. Lovely and beautiful human beings, and I'm honored that they're a part of my life. There's so much attention placed on how our parents shape our lives, and it's certainly true. And my sisters are a part of my being, both the sister of whom I can't remember any part of my life that doesn't have her somewhere in it, and the sister I remember welcoming into our family with such joy. I can't imagine my self without my sisters. I love you. 4. My dear dear friends. All of my friends are dear to me. And the friends I'm thinking of have been a part of my life for almost thirty years. We grew up together. We've connected stayed connected through thick and thin, from pimples to wrinkles, through college and work, joys and worries. I love you and I admire you, my dears, and I cannot imagine how empty my life would have been without you. 5. My hair. I'm certain my life would be completely different if only I had long glossy thick perfectly-behaved hair. Check this out. 6. Becoming a mother. I remember when I was pregnant with my daughter. I heard a friend's son call to her, "Mom?" and suddenly I truly realized that I was about to turn into Mom for someone. I felt panicked, short of breath for a moment. Now I turn my head when I hear a child crying in the grocery store, even if I know that all of my children are safely at home. I smile and try to offer a smile when I see a mother struggling with a tantrum-y little one instead of thinking, "My kids will never be allowed to do that." My life became less about me. My heart grew. 8. Autism. Oh, the lessons I've learned. My heart has been broken, my patience has been stretched beyond its limit and I've been so worn down that I wanted to give up. 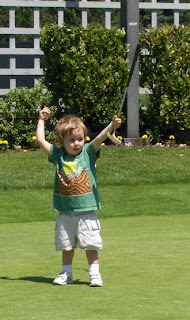 I've celebrated victories that most parents take for granted. I've been tested. I've been blessed. I've been burdened. What a gift I've been given. 9. My first tattoo. "You'll never get a tattoo," my ex said to me. "You'll just keep talking about it and never get one." I was incensed. How could he say that? Then I began to consider. Was it true? I realized that I could either be the kind of person who always talked about wanting a tattoo, or the person who went and got one because that was what I wanted. It took me a long time to decide what I wanted. I got a sun on my ankle to celebrate and symbolize a new day, a new time in my life, strength and light. I've not a single regret. As a matter of fact, I went and got another to celebrate my fortieth year. Maybe I'll post a picture sometime. 10. Loving Husband. Who knew that "respectful and kind" was my type all this time? Sheesh, it took me long enough to figure that out, anyway. Now I only overreact most of the time and sometimes I'm not completely controlling and grouchy. He's been a good influence. He'll laugh and kiss me when he reads this, and say, "Now, you were never like that, honey." And he's right....partly because he's a good influence. 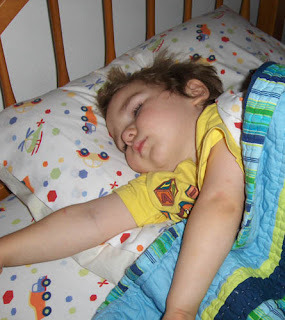 That's my baby, my last baby, sound asleep in his big boy bed. Of course the littlest gent is not a baby any more. "I not baby!" he insists emphatically with stormy brow. 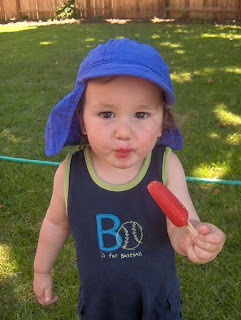 But he's the last of my babies and I find myself reluctant to let go of his babyhood, wanting to savor every last sweet second of it before he's hulking around with smelly feet and acne, inhaling everything he can find in the fridge. Until last night, he'd been sleeping in our bed, then in his own bed pushed up against ours, crawling back to snuggle with Mama in the early hours of the morning. Yesterday, we ("we," in this case meaning mostly loving husband) put his brothers into bunk beds and moved the baby into the Big Boy Room. This is the very first time since two weeks into my marriage to loving husband that I haven't been pregnant, or sharing the bed with a little one, or both. The very first time in over seven years. "Hooray! What a big boy! You get to sleep in the Big Boy Room!" I crowed to my fine little gent. "I can't wait to have the bed all to ourselves," I told loving husband. "Won't it be nice to have room to stretch?" I asked. "There's going to be so much space in here without that extra bed," I said. The bed felt empty this morning. There was lots of room to stretch, and the bedroom seems spacious again without his bed next to ours. But....no warm little one snuggled next to me, sharing my pillow. No sweet smile when I open my eyes. No "Hi Mama," whispers. It's been a year of growing up for our family. Our younger lovely lady is slowly leaving her girlhood behind. "I don't really play with dolls any more," she told a younger friend as she passed on an armful of dolls. I'd noticed, but to hear her say it like that, oh, my heart clenched. "Wait!" I want to cry. "Wait! I'm not ready for this! Just one more year! Just a little more time!" Her lovely older sister is returning to high school in the fall, giggling to her friends on the phone about dances and classes and teachers and boys. "Come back!" 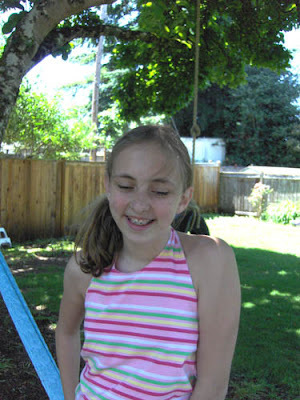 I want to shout to the little girl with the freckles and the sweet smile. "Where are you going?" And now this. I want to say "Wait! Wait for me! I'm not ready!" I know it's time. They have to grow up and move on, they've got their whole lives to live. But I wish, I wish, I wish that I could press pause, just for a year, a month, a week. Even for just a day. One more minute. One more snuggle. One more morning kiss, a day with dolls, an afternoon reading on the couch. A tea party. One more sweet smile. Life is precious. It goes by us so quickly. Kiss your babies and hug them tight. 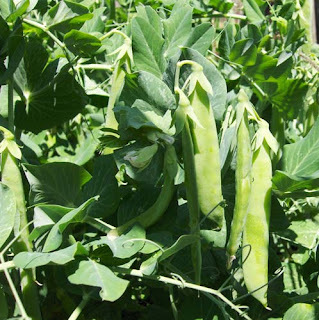 We got a handful of ripe peas-in-the-pod today. Garden candy. Pop the end, zip the pod open, slide the green peas out of the pod with your thumb, right out into your hand. Pop them into your mouth. Oh, so sweet. On a beautiful sunny almost-summer day, plan an outing to the strawberry field with dear friend. Wake up to dreary gray skies. Load buckets, boots, and raincoat. Pick up dear friend and walk, bike or drive to the nearest strawberry field. By the time you reach the field the gloomy skies will begin to sprinkle on you, dear friend, the strawberry field, and everything else. Pick two flats of strawberries, give or take, with dear friend. Dear friend and I discovered that picking berries in the rain is far better than picking berries in the blazing sun. 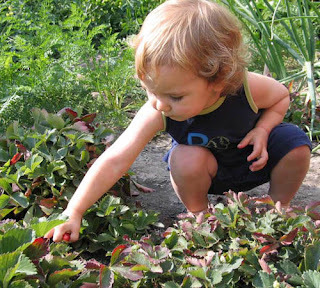 We also discovered that picking strawberries at our age is far less easy than it was when we were kids. We went snap, crackle, pop! as we made our way up the row. But the rain was just a cooling sprinkle, the berries were perfect, and dear friend and I got a chance to talk with one another uninterrupted about our families, our faith, and homeschooling. 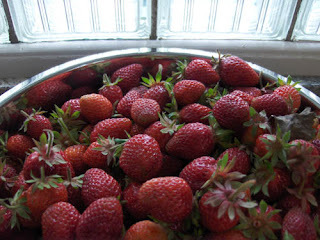 Later this afternoon I hulled strawberries and watched the rain. 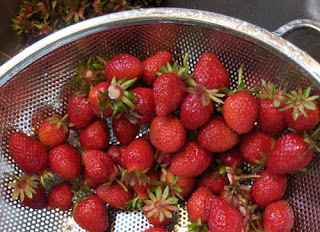 I hulled strawberries and watched out the window while loving husband, my brother-in-law, my nephews and a couple of my kids loaded up the junk that had accumulated behind the garden shed. (We postponed a planned barbeque, but went ahead with the junk removal.) I hulled strawberries and dreamed of shortcake. It takes a long time to hull so many strawberries. 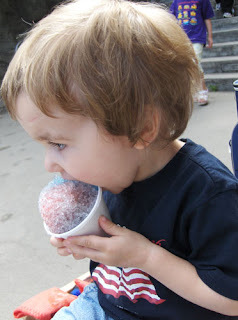 I had a sinkful of little greenish strawberry tops by the time I was finished. The best strawberry hulling tool I've ever used? My thumbnail. I've got a tomato corer/strawberry huller like this one, but I always fall back on my thumb because it's just plain faster. I sent a bowl of strawberries with brother-in-law, and set aside a large bowl for shortcake, then froze the rest. A berry freezing tip, shared long ago by my sister: Spread the berries in a single layer on a very very lightly greased cookie sheet then set them in the freezer until they've hardened. Then put them in the freezer bags or containers. You get beautiful non-smushed frozen berries that don't stick together. You need a big bowl of strawberries and some sugar. If you're a measuring kind of person, like loving husband, about eight cups of berries and 1/3 cup sugar. If you're an eyeball kind of person, like me, you need a large bowlful. Take a little less than half the berries (about three cups, for measurers) and mash them with a potato masher or a fork. Slice the rest, and mix the sliced berries and sugar with the mashed berries. Set aside. In a small bowl mix the egg and the milk, then gently stir them into the flour-butter mixture until the whole thing forms a sticky ball. Dump it out onto a floured counter, knead just a bit to get it to come together, then pat into a flat circle about 3/4" thick. Cut biscuit rounds and place them on a cookie sheet. (I use a small cup for this since I don't have a 2-1/2" cookie cutter. It works.) For sugary-topped biscuits, brush biscuits lightly with cream or egg white and sprinkle lightly with sugar. Bake in the oven for about 12-14 minutes. Leave them on the baking sheet to cool for about ten minutes. For heaven's sake, use a spray whipped cream if it's handy. We hardly ever use whipped cream so we usually don't have it on hand. I get out the stand mixer, attach the wire attachment, pour whipping cream and sugar into the bowl and turn the thing on high. When it looks like whipped cream it's ready. Slice the biscuit in half and place it in a bowl. 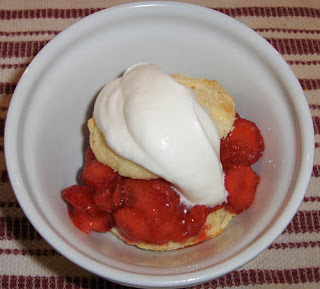 Ladle strawberries over the biscuit and top with whipped cream. It's worth kneeling in the dirt, in the rain, with crackly knees and greenish-red strawberry fingernails for this. Heavenly.